The effects of a serious burn injury can be both physically and emotionally devastating due to the disfiguring of the skin. Even with today’s medical advances in wound treatment, therapy and plastic surgery, a burn victim is often left with permanent emotional and physical scarring. Although it can be a traumatic experience surviving a residential fire, chemical explosion, gas leak, electrical burn or natural fire, there is help available to assist you in the recovery process. The Los Angeles burn injury lawyers of McNicholas & McNicholas offer support, legal assistance and professionalism for you and your family. How are Burn Injuries Caused? According to the American Burn Association, about 3,400 people die each year from fires, burns, or smoke inhalation and about 40,000 people in the U.S. are hospitalized every year for burn-related injuries. Burn injuries can be caused by many different scenarios, ranging from car accidents, electrical accidents, chemical accidents, work related accidents, defective products, or hot food and drink from a restaurant. Your recovery plan and process will depend on the severity of the burn and may require compensation for your personal trauma, pain and suffering, medical bills, lost wages, future medical bills, permanent scarring, disfigurement, ongoing therapy and future surgeries. Sometimes infections may occur due to the severity of your burn, which could lead to other health issues and compromise your immune system. It is important to get help right away from a burn injury lawyer who can help you navigate your way through the medical bills, emotional trauma and legal advice, as well as additional documents you may need to support your case. What are the Types of Burn Injury Classifications? Third degree burns are the most serious of burns, but that does not mean first- and second-degree burns, or burns from coming into contact with an electrical line do not require immediate attention. You should always seek medical attention in an effort to avoid long-lasting negative impacts. What are Signs of a Serious Burn Injury? 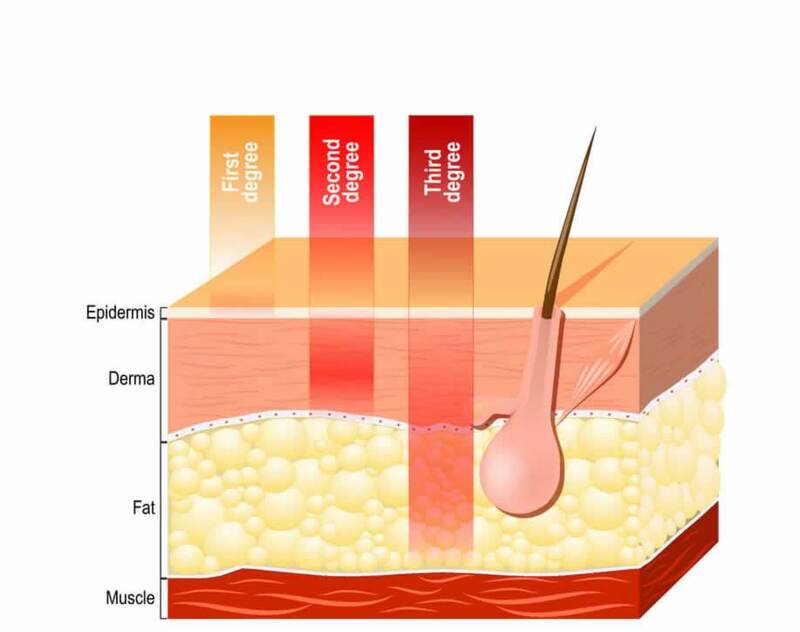 Signs and symptoms of a burn injury vary based on the degree of the burn. The most common signs of a burn injury include swelling, blistering and scarring. In the worst cases, death can result. Burn injuries also commonly lead to infections because of the damage done to the top protective layers of skin. Just as signs and symptoms vary based on the degree of the burn, so too do treatment options for varying types of burns. For mild burns, over the counter creams can be used to treat any pain, swelling, and potential infections. For more severe burns, cleaning and skin grafting may be required. These can be lengthy, painful, and expensive processes. How Do I Establish Liability in Burn Injury Cases? Liability depends on how you were injured. For example, if you were injured from a chemical burn at work, you may have a case against the maker of the chemical or the device the chemical was stored in. This would be separate and apart from the worker’s compensation system. As another example, if you were burned as a result of the use of a product (like a hot water heater or an electrical device), you may have a products liability claim depending on the facts. Our Los Angeles burn injury lawyers at McNicholas & McNicholas offer legal assistance and professionalism for you and your family throughout the process of your burn injury case. What Do I Have to Prove to Get Compensation for my Burn Injury? 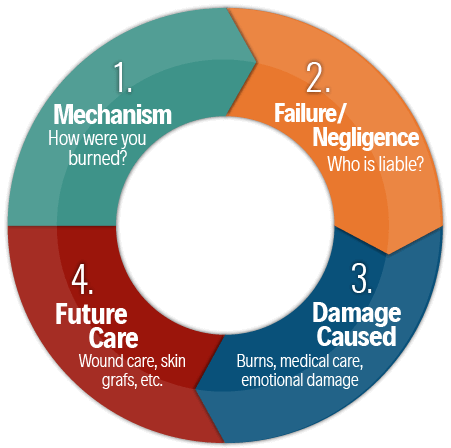 The process of your recovery will depend on many things such as the burn location and severity, and the facts giving rise to the injury. The injury may require you to seek compensation for current medical bills and for those in the future, for suffering and pain you experienced, for lost wages, permanent disfigurement and/or scarring, the personal trauma, future surgeries, and therapy as necessary. Additional items will be considered, such as other health issues that may arise from infections due to the burn severity. The California statute of limitations varies depending on the cause of the burn injury, so it is important to get help right away from personal injury attorneys who can help you navigate your way through recouping the cost of medical bills, lost wages and more. Since 1993, McNicholas & McNicholas has been handling complex and catastrophic cases related to serious injuries in California, resulting in multimillion dollar results for our clients against large private and public organizations. We have the resources to ensure your needs are met in a timely and efficient manner. We believe that large settlements and verdicts can help an injured person put their life back together, and can also make an impact on holding companies and industries accountable to create, improve and implement better products and services. For more information on how we can assist you or your loved one when you have been involved in a catastrophic accident that results in a severe burn, contact our offices today at 866.664.3055.